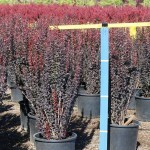 A distinctly upright, slow growing shrub with reddish purple foliage. The fall color is bright red. Tiny yellow flowers appear in the spring as the foliage emerges. Glossy bright red berries can persists well into winter. It prefers full sun and a well-drained soil. 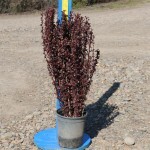 May be used as a hedge or as an accent in the shrub border.